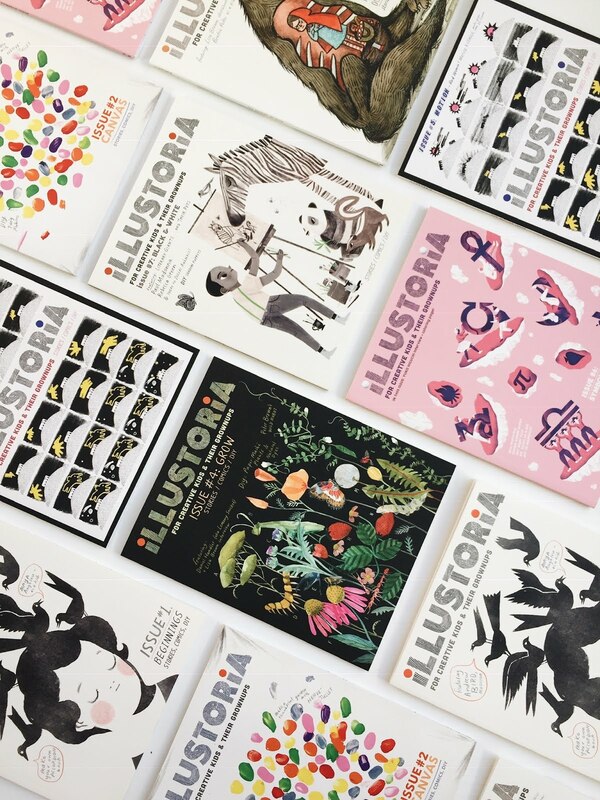 Illustoria is a print magazine for creative kids & their grownups. It celebrates visual storytelling, makers and DIY culture through stories, art, comics, interviews, crafts and activities. Their high-quality, tri-annual publication is geared toward readers ages 6–12 and the young at heart. Let's talk Joanne Chan and Amanda Uhle! LTPB: Joanne, for those of us who aren’t familiar, what is Illustoria, and what do you do? JC: Illustoria is a tri-annual print magazine for creative kids & their grownups that celebrates visual storytelling and DIY culture. 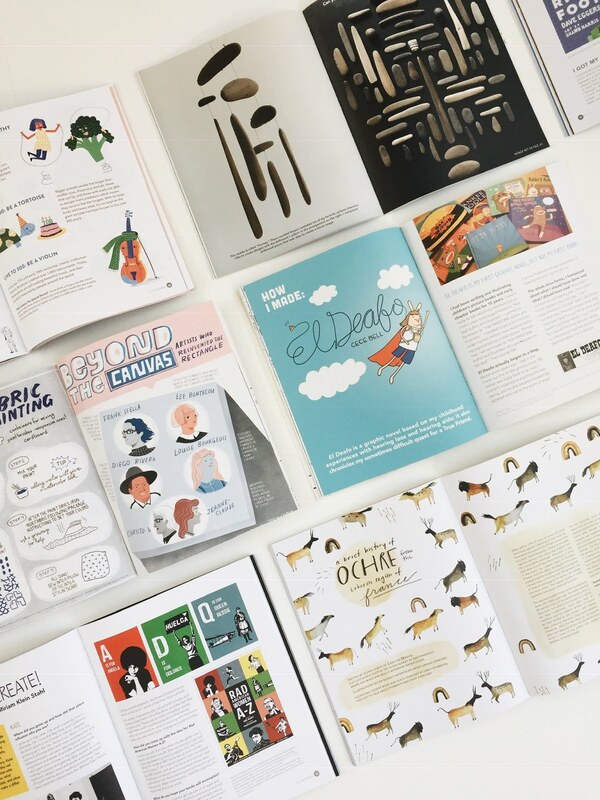 Each issue centers around a universal theme and features art; stories; interviews with artists, writers, and makers; DIY crafts; a recipe; playlist; art supply and book recommendations; and activities—all aimed to inspire creativity in kids and adults. As the founding publisher and editor-in-chief, I’ve had the fortune of curating and developing each of our first eight issues. My main role has been to shape the editorial content and visual tone by identifying the featured contributors and working closely with our extraordinary art director, Beth, along with our assistant, Claire, from concept through production. The heart of what I do entails selecting the issue’s theme and brainstorming ideal content; identifying a cover artist and concept; creating a flat plan and pacing the issue’s content; collaborating with artists and writers on original stories, essays, comics, and art; interviewing, transcribing, editing; occasionally contributing stories, writing prompts, and crafts; providing feedback at every stage of the designed layouts; and—the most fun part of all—being awed by the amazing collective work of our super talented contributors and staff. On top of all that, there’s the busy work of managing schedules, paperwork, budgets, sales and marketing, customer service, and so much more that goes into running a small indie mag! LTPB: This is a particularly exciting time for the magazine because you are now published by McSweeney’s! Amanda, what can you tell us about your nonprofit publishing house and what you do there? AU: At McSweeney’s our approach is different than most traditional publishers. As a nonprofit, we’re free to make bold choices about publishing writing and art that we know is important, even if we also know those choices aren’t necessarily the ones that will earn a profit. Support from forward-thinking foundations and donors means we can seek writing that pushes us to see beyond ourselves and artwork that’s eye-opening or offbeat. Since our 1998 founding by author Dave Eggers, McSweeney’s has become well-known for our eclectic book publishing program, our humor website, and our award-winning lit journal, Timothy McSweeney’s Quarterly Concern, whose recent issues have arrived as hardcover books, as short stories printed on party balloons, as a crate full of stories, illustrated to appear as a man’s head, and more. Adding Illustoria to the mix seemed absolutely natural. LTPB: I bet, and it sounds like we’ll continue to get the same Illustoria issues that we love, but with an added dose of student voices, is that right? What can you tell us about that? AU: Dave and I adore all that Joanne has done so far, along with Art Director Beth Haidle and Publishing Associate Claire Astrow, who will continue on with us. Every subscriber looks forward to receiving this beautiful, thoughtfully-conceived magazine in their mailbox, and we know that the content and execution is so strong that people hang on to––and seek out––back issues. It’s beloved because the quality is so unerringly high, a value that rings true for anyone who has picked up McSweeney’s books or Quarterly issues these last twenty years. We’ll absolutely keep Illustoria as beautiful as ever. We think a magazine this lovely deserves a wide readership, and a major part of our plan is to expand circulation with a special focus on schools, libraries and other organizations who serve under-resourced communities. There’s nothing more important to us than providing opportunities for kids to be themselves, to explore new ideas, and to be heard. We’ll work with partner organizations in the International Alliance of Youth Writing Centers and beyond to identify exceptional writing and illustration by school-aged students. Young delegates to The International Congress of Youth Voices will have a forum in the magazine, too, to illuminate the change they’re making all over the world. LTPB: Joanne, what will your involvement with Illustoria look like now, and what new projects are you focusing on now? JC: My involvement is to hand off this beautiful magazine to McSweeney’s so that Amanda and the Illustoria staff can continue the good work! That said I will be making myself available for feedback and suggestions as much as desired, but mostly I will be watching and cheering from the sidelines as an avid reader. 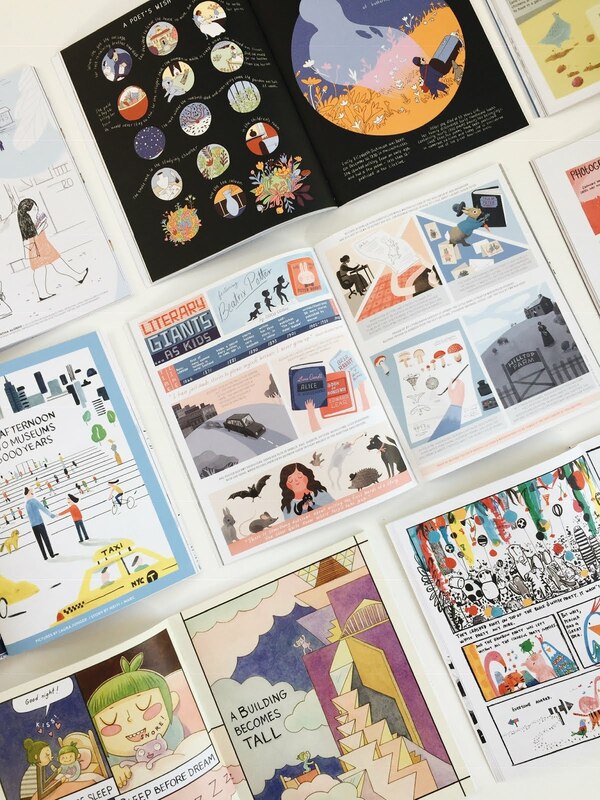 Dave and Amanda are true believers in the power of stories, art, and print, and it’s an honor that Illustoria has their support and unwavering commitment to quality storytelling. It’s exciting to know that going forward the magazine will further engage youth contributions, will be more widely available through schools and libraries, and that the legacy of Illustoria will grow richer with every issue. As for new projects, I do have a few! My main goal is to spend more time with my growing family. Having my third child just over a year ago has really brought into focus how quickly time flies and how the precious years of childhood (or should I say parenthood?) are not to be squandered. This desire to slow down time prompted me to start a very personal writing and drawing practice that approaches creativity on a micro level. In other words, I’m fitting in small projects where I can amidst the busy life of a parent. It’s all very steeped in the Illustoria ethos. And since I’m such a lover of print and publishing, likely a very low-key zine and personal blog will follow…. Another exciting project I’m tangentially involved in through my husband, Mark, is the incubating gallery space and artist-in-residence program at the Thatcher Hotel, a renovated, lovely historic Victorian in Mendocino County that opens this summer. As its creative director, Mark is collecting and curating art to fill the rooms, lobby, and gallery space, and I can’t help but chime in with my own two cents. My first coup (fingers crossed, as we are still working out the details!) is to get Brian Rea up from L.A. to create a mural for the hotel. He has been a dream artist I’ve been wanting to work with, so I’m thrilled to be continuing creative collaborations with artists I admire in new ways. LTPB: Amanda, can we get a hint at what the next issue will look like? AU: Before this transition was final, Joanne and the rest of the Illustoria staff had begun planning for an exciting issue #9: Food! That issue––featuring a youth food activist, a feature on urban farming, recipes and activities for kids and families, and artists who use food as their subject matter––will see a few small changes that reflect the transition including interviews conducted by school-aged students from Reykjavik, Iceland and Greensboro, South Carolina. Issue #10 will likely reflect a few more. We have dreams of a youth-written advice column for creative kids, how-to-draw sections with instructions from professional artists, and many more opportunities for school-aged students to see their work published in the magazine. AU: I’m a huge fan of the work of Philip and Erin Stead, and I’m especially enamored of Erin’s elegant illustrations which convey her characters’ emotions so thoughtfully. Her work also does something I always hope to do in my own work—elevate everyday things and settings into something remarkable and authentic. I’d be very fortunate to have her as a collaborator for anything. JC: May I choose a graphic-novel autobiography? Because that is my ideal writing project. I would love for Thi Bui to illustrate it. Bui’s memoir The Best We Could Do so powerfully captures the personal and generational struggles, yearnings, triumphs, and heartaches of her family’s journey from Vietnam to California, and it really struck a chord with me as the daughter of immigrant parents from Asia. I’m always amazed by the depth of emotion that can come through illustrated characters in the best graphic novels such as Cece Bell’s El Deafo, Marjane Satrapi’s Persepolis, and Gene Luen Yang’s American Born Chinese. For my own illustrated autobiography, Bui’s style and execution would definitely nail it for me. A big thank you and congratulations to both Joanne and Amanda! 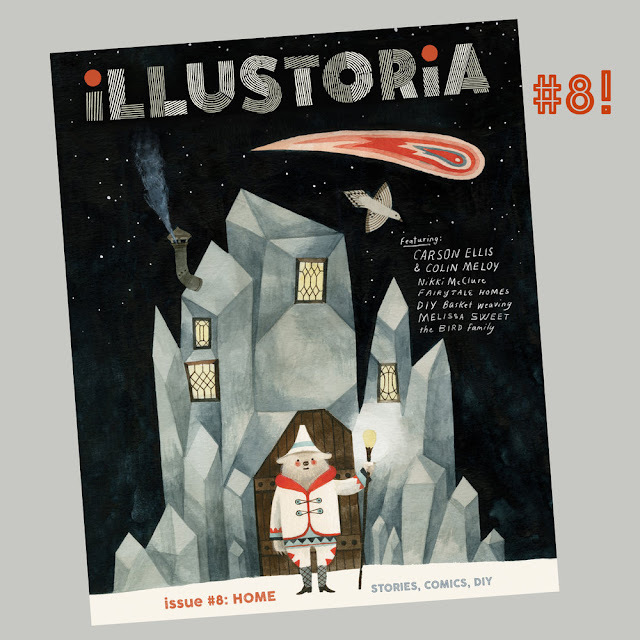 Issue #8: Home is available now (as is a bunch of their backlist) from Illustoria! Special thanks to Joanne, Amanda, and McSweeney's for use of these images!